Showers and tubs can be slippery and hard to find your balance in. Clean yourself without having the fear of slipping and falling when you bring one of our shower chairs into your bathroom. Our bath seats are durable and designed to provide both comfort and safety in the bath tub. The bottoms of these shower stools and benches have non-slip grips that will hold the seat in place no matter how much water fills your tub. Folding Bath Bench, Drive Medical 12486. 300-lbs weight capacity and 20" wide seat. Easy folding bench folds for compact storage. Free shipping. Invacare 9781 I-Fit Shower Chair is height adjustable for personal fit. Suction cup feet won't slide around in the tub or shower. Invacare I-Fit shower chair snaps together without screws or bolts. Premium Series Bath Bench with Back and Arms , model RTL12505, 350-lb weight capacity.Lightweight design has large stable legs with soft non-slip feet. Free shipping. Nova 9120 Deluxe Adjustable Shower Bench without back. Nova shower/bath chair has red safety handle and is easy to keep clean. Anodized aluminum frame is rust-proof and has 300 lbs. weight capacity. Nova Adjustable Height Bath Bench with removable arms has 300 lbs. weight capacity, anodized aluminum frame. Nova 9020 Adjustable Bath Bench with Back has adjustable height seat, easy to keep clean and will never rust. Nova 9050 Adjustable Bath Bench without Back has adjustable height seat, aluminum frame won't rust. Weight capacity of 300 lbs. Nova 9010 Adjustable Bath Bench without Back has adjustable height seat and non-slip feet. Swivel Seat Bath/Shower Stool with 360 degree rotating seat. Height adjustable, 400-lb weight capacity. Free shipping! Bariatric Shower/Bath Chair, 500-lbs capacity, 20" wide seat, adjustable height legs, lightweight aluminum frame. Nova 9036-R Bath Seat Back and Removable Arms. Anodized Aluminum frame, adjustable height, 300 lbs. weight limit. Nova 9037 has a front hygienic cutout, removable arms, anodized Aluminum frame, adjustable height, 300 lbs. weight limit. 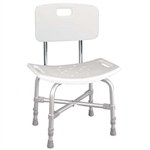 Features large handles to make sitting down and getting up bath safer and easier. Seat height adjust 16.5 - 22.5", 20" x 18" seat. Shower Chair has 300-lbs weight capacity, 16" wide seat, 18.5" between armrest. Arms are padded and removable. Nova Adjustable height Hygienic Bath Bench with Back has 19"W x 12.5"D seat and 300-lb weight capacity. Nova 9404 Folding Shower Seat attaches to wall and folds up when not in use. Heavy Duty Bariatric Bath Bench with Back. Bariatric shower chair has 500-lb weight capacity. Adjustable height seat, anodized aluminum frame won't rust. Nova 9400 Foldable Shower Chair with Back has 250-lb weight capacity. Folds and unfolds in seconds for easy storage. Lumex 7945A (with arms) Platinum Collection Deluxe Padded Bath Seat has 300-lb weight capacity and seat is height adjustable. PHC exclusive - Nova Orth-Med Bath Safety Set includes premium bath bench, bath mat, tub grab-bars, hand-held shower. Great way to get the bathroom setup for fall prevention. Shower Chair with Swivel Seat has 300 lbs weight capacity. Seat is height adjustable, turns 360° and locks every 90°. Nova 9405 Swivel Bath Seat swivels 360 degrees w/250-lb weight capacity, mounts on top of tub lip and is easily removed when not being used. Shower Chairs are not just for the handicapped or elderly. Anyone looking for a place to sit down in the shower or bathtub can use a shower chair. Our medical shower chairs come in a variety of shapes and sizes. From round swivel seats to seats with handles or seat backs, we offer handicap shower seats that can accommodate any size and height of your tub. All of our products are rust-proof, meaning that you can use them multiple times without having to replace them. Avoid having accidents while you shower when you order one of our tub transfer benches or chairs today!